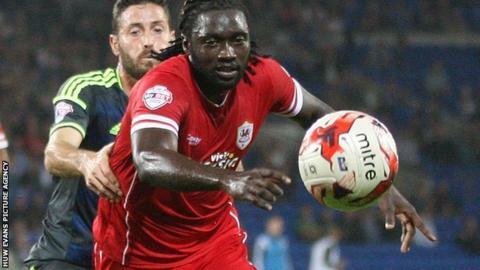 Kenwyne Jones remains a "big part" of Cardiff City's plans, according to manager Russell Slade. Jones is expected to return to training on Wednesday for the first time this summer after being on international duty with Trinidad and Tobago. The 30-year-old striker was loaned to Bournemouth at the end of last season and said he did not know if he was wanted by Cardiff. But Slade said: "He's our player and a big part of what we are trying to do." Jones played every minute of every match for his country at the Gold Cup, held in America and Canada in July, as the Soca Warriors reached the quarter-finals. Ten days after losing to Panama on penalties in the last eight, his fitness will now be assessed by Cardiff before Slade decides whether to involve him in Friday's final pre-season friendly at Premier League newcomers Bournemouth. Jones ended last season on loan with the Cherries, a move he found "surprising" and prompted him to question if he had a future with Cardiff. He has a year left on his contract after joining from Stoke in January 2014 and Slade says the striker has plenty to offer. "Obviously we need to give him a little bit of time, we'll see how he is from his excursions," said Slade after Tuesday's 2-1 friendly win over Watford. "But of course, he's our player. Hopefully he's fit, we'll do all the screening and testing we need to do with him and see where he's at." Cardiff's lack of transfer activity so far this summer and the imminent departure of forwards Javi Guerra and Adam Le Fondre suggests Jones will be needed to bolster striking options. Slade admitted he had expected to sign more senior players having so far only recruited Sammy Ameobi on a season-long loan from Newcastle, but said there was a "possibility" of signing others before the first game of the Championship season against Fulham on 8 August. "It's all a question of spinning plates. We haven't done as much business as others - that doesn't necessarily mean we're not going to challenge for anything because I think we've got a good group [of players]." "Derby and Middlesbrough have shed out a lot of money early on, but apart from those two I don't think there's been an awful lot of activity."